Prominent & Leading Manufacturer from Thane, we offer centaflex coupling for transit mixture. Obliged to our expertise in this industry, we are engaged in manufacturing and supplying an all-inclusive range of Centaflex Coupling to our prestigious clients. This coupling is cautiously manufactured with the employment of hard working workers and contemporary technology in synchronization with set universally accepted norms. 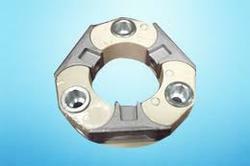 The provided coupling is effectively used for absorbing vibrations and shocks by using elasticity of rubber and plastic. Our clients can avail it at reasonable price.